Cat-themed valentines cards for the one you love! 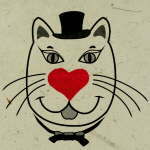 You don’t need to be a cat lover to love these cat valentines cards - Choose one of our cat valentine cards for the one you love! 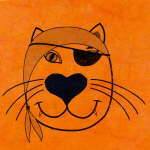 Read more about our Cat valentine cards and see the Cat card designs enlarged. 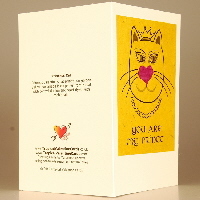 Click on the handmade valentines cat card photos for more info or on blue “Buy” button to buy a card. 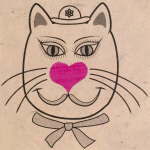 A range of larger 7" by 4½" handmade cat valentines cards with silk heart noses on handmade lokta and banana paper and with a valentines greeting printed on the cover. 30% larger than our standard valentines cards. 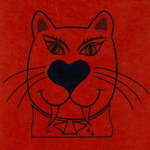 Each 7" by 4½" (17.8 cm by 11.5 cm) handmade valentines card bears a unique design on the centre of the front cover. The designs are approximately 4” (10 cm) square and comprise a rectangle of lokta handmade paper printed with a cat design and with a central appliquéd heart of silk dyed with natural dyes. All the heart cards are unique and the design may vary from the photograph. The front cover is titled with a valentines greeting but the inside of the valentine card is left blank for your own message. The cards are made from cream-coloured, 100% recycled paper card. 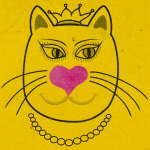 Click on any photo below for an enlarged view of the Cats Valentines card designs.